BLT Garage Floor Liner 7.5 Ft. X 14 Ft.
BLT Garage Floor Liner 7.5 Ft. X 17 Ft.
BLT Garage Floor Liner 7.5 Ft. X 20 Ft.
BLT Garage Floor Liner 8 Ft. X 22 Ft.
BLT Garage Floor Liner 9 Ft. X 20 Ft.
BLT Garage Floor Liner 10 Ft. X 22 Ft. Choosing a garage flooring product can be difficult and very time consuming. While the process of choosing a garage floor can be cumbersome, it is important that you take your time and make sure that you choose the product that is right for your job. G-Floor from Better Life Technology has some definite advantage over other products such as snap together garage floor tiles. G-Floor garage floor mats offer a virtually seamless floor that provides a high degree of protection to the concrete below. While garage floor tiles provide an attractive appearance, most tiles have a seam every 12" to 18" where water, dirt and chemicals can seep through and stain the floor below. For example a 2 car garage measuring 20' x 24' would have one seam with the G-Floor product as opposed to 480 individual tiles with a seam on each side of each and every tile. Installing G-Floor is often much faster than installing a snap together tile system. While most tile systems require you to interlock them on each and every side, G-Floor garage floor mats can be laid next to each other and can often be installed in under an hour. 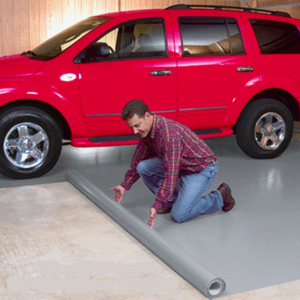 One final advantage of G-Floor garage flooring is that it is constructed from flexible PVC. The PVC provides greater anti-fatigue properties than a solid tile while still being strong enough to stand up to industrial garage conditions. G-Floor is less expensive than most tiles and PVC requires a thinner layer to accomplish the same function and PVC expands and contracts less than polypropylene. There is a lot of garage flooring on the market and everybody has different needs. If you are looking for a simple, affordable, attractive product that provides a high degree of protection to your new or old concrete slab, then G-Floor is one option that I would definitely consider. All Garage Floor Liners SHIP Ground only to your garage door. $50.00 shipping charge per mat. Expedited Shipping not available. Please allow 2 weeks for delivery.